Rumor: Special Nintendo Characters To Show Up At GDC 2009 Three, that's right, THREE Nintendo star characters are rumored to show up in some form during GDC 2009, and we aren't talkin' about those fanboys that like to dress up. Our sources say either hints of future games or more will be shown March 23rd-27th at the Game Developers Conference. Obviously by looking at the picture you can tell who two of the three characters are. That's right. 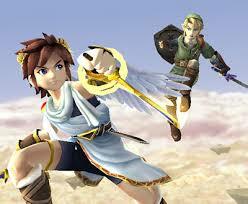 Link and Pit are said to be talked, hinted about in some way at the show. Who is the other one you ask? Well, we figured we'd have a little fun by giving you hints and guessing. Are you ready? Did you get it yet? Yeah, easy hints, we know. Well anyways, that's right. Ice climbers, Link and Pit are rumored to be showing their faces or listing their names in some way. Guess we'll have to wait a week and a half to see what becomes of the rumor. As always, VGE Utopia will stay on top of the rumor.